(Please note that this is the UK Definition of Ratbike & not the US version). 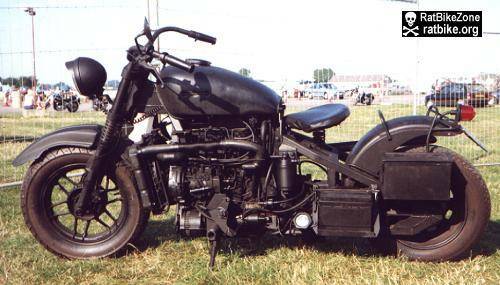 VW diesel motorbike by Russ (Mouse). Russ picked up this 1995 VW 1.9Litre Golf engine for a grand total of £21and fitted it into an old Dnepr frame. It's seen here at the 2011 Hamm Rally. The motorbike made it there and back despite having to recieve a new battery on route. Months later it put a piston through the side of the engine and sadly is no more. More on this bike on the forum. 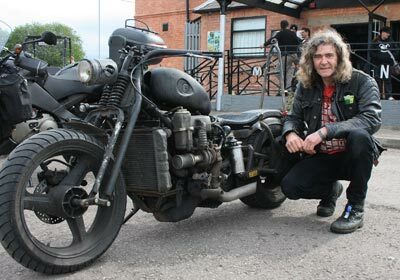 Russ is known on the UK Ratbike scene for his diesel motorcycle builds. The 'built in 1 week' Diesel Motorcycle by Mouse. Mouse was forced through necessity to build his latest creation in seven days flat, fuel costs being very much on his mind. 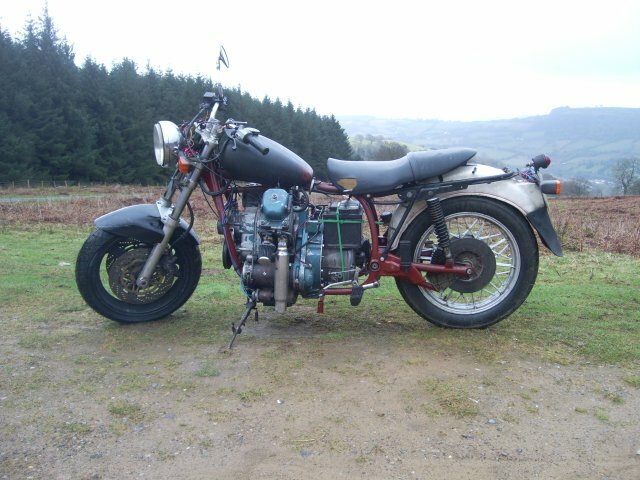 It features a Kubota 482cc twin engine from a refrigeration truck mated to a haft-drive and fitted into an older BMW R65 frame. No cutting of frame was necessary either! As always, Molly the dog was in the trailer behind! There are intricate details of the build on our forum! 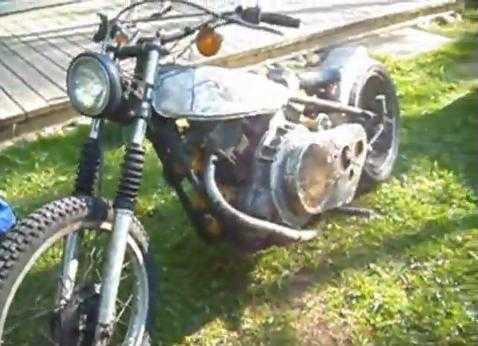 The project is based on a Motorenwerk Cunewalde 2VD 8/8 - 2SVL engine, which is German and made in 1974. It is 800cc V twin air cooled and rated at 15PS on the engine plate. Its engine plate also states it weigh 125kg but I kind of suspect it is a bit more than that. Frame is from a BMW R80. Checkout the build thread here - it's VERY informative! This build has caused Mouse a headache or two but he's stuck with it and it's now on the road. Well done! Update: The above bike melted one of its ally heads! 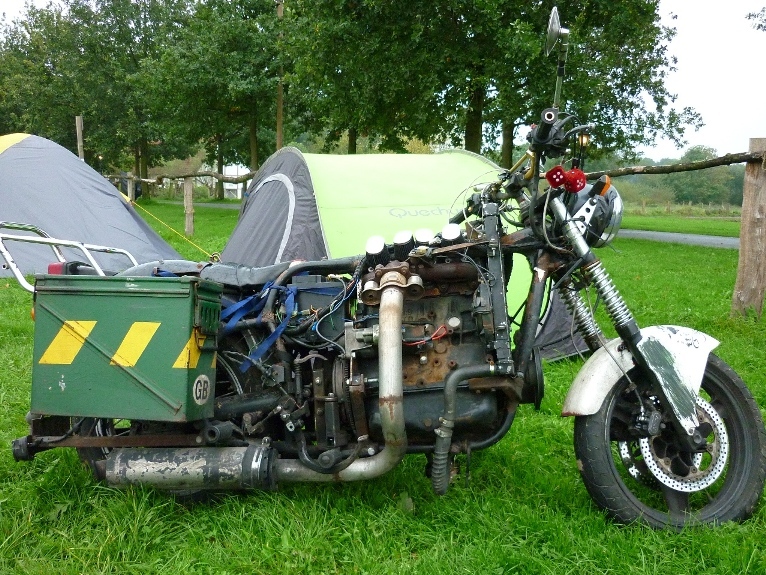 A 1982 Suzuki gsx 1100e chassis, with German Farymann 250cc single diesel motor, 5 liter plastic can as tank, dustpan primary cover, deckchair-style foam seat. It produces 6.5bhp which goes to the rear wheel via an old NSU OSL 250cc clutch and gearbox. The engine itself is extensively rubber mounted and rotates back and forward to a quite alarming degree. The cage on the back was for a dog and the blue tube provides heat whever the rider wishes to stick it! A 250cc Farymann engine in a Suzuki frame. Save picture for a bigger image. Haydn Franklin is proud of his 1 litre Daihatsu Charade powerd Diesel motorcycle as it reportedly cost him less than £400 quid to build. Displaying it at the Rat & Survival Show recently (11-13th May 07) he said it's good for 100mph and will do 85 to the gallon. The bike has apparently already won more than 20 trophies. 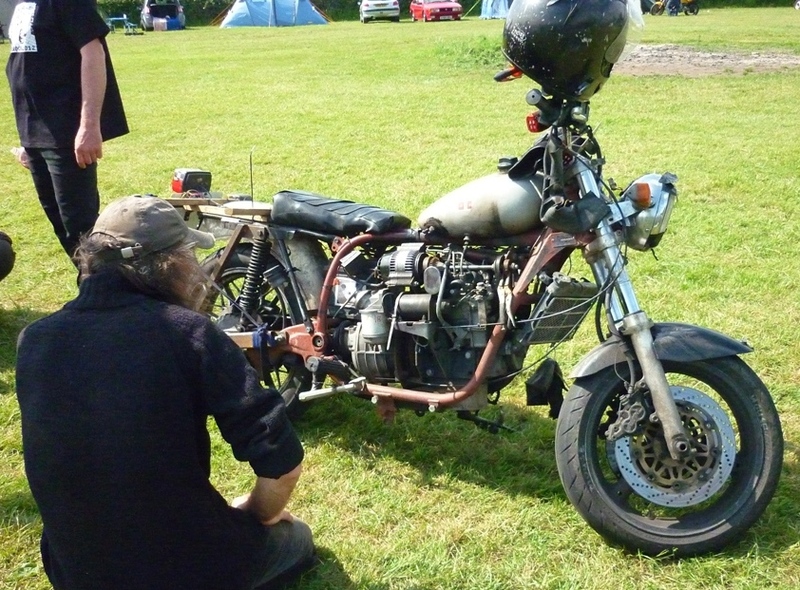 The bike itself has a hand-built frame made from old water pipes and fashioned with the aid of a pipe bender. It may look like a hard tail but there is a mono-shock cunningly concealed beneath the seat. Most of the parts arraently came from a skip or dumpster. The bike won best in show and best engineering. Haydn's latest creation seen here in England. It uses the 3 cylinder Charade Diesel engine, 1000cc. Plenty of these cars were sold in Ireland I'm told. Haydn's 1.6 litre Ford fiesta engined Rat bike. More here. A more recent of Haydn's (is that how you spell his name?) motorcycle as seen by Kev on the Isle of White. New information on this bike from Sandy, the bikes builder. I built this bike in 2000 as my first custom project. It was a feature bike in 100% Biker and I still own it. It has a 250cc Yanmah generator engine with Burman 3 speed (+ reverse) gearbox. I built it in a stripped down vintage style with homemade frame and BSA M20 forks. It is 5HP @ 3000RPM and does 45mph flat out. 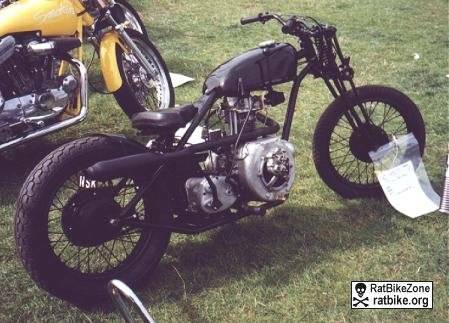 Another picture from the excellent Ratbike site. 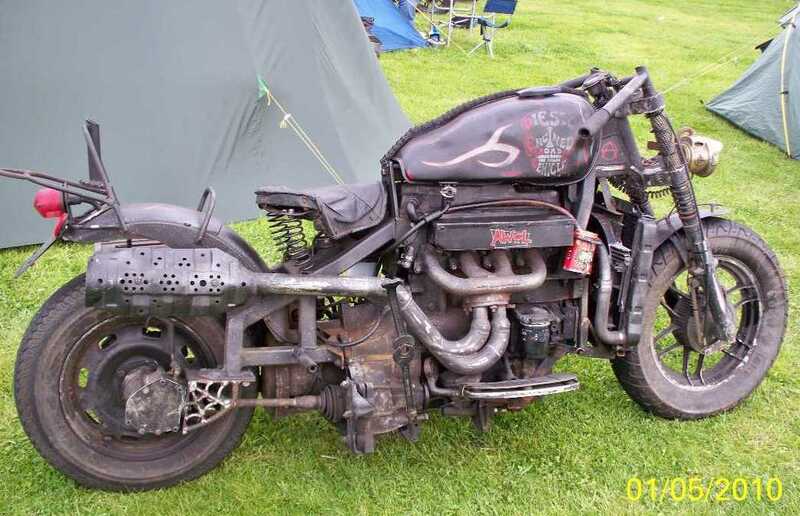 This Ratbike is Yamaha based and has an East German Diesel engine fitted.